Coffee Cake + banana bread = Banana Bread Coffee Cake! 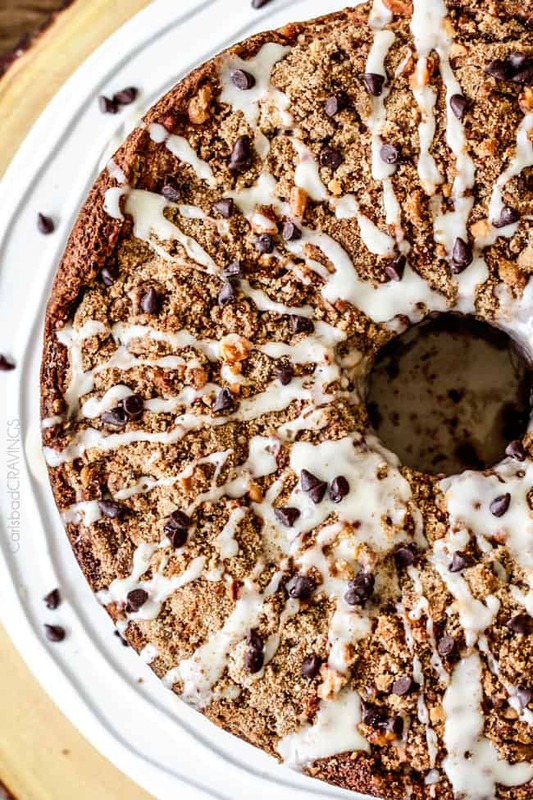 This Coffee Cake is made with banana cake batter, riddled with chocolate chips and walnuts (optional) with an INCREDIBLY creamy cream cheese filling all showered with Cinnamon Walnut Streusel and Vanilla Drizzle! AKA the best coffee cake ever AND the best banana anything ever! I’ve also included how to ripen bananas quickly, how to make coffee cake, how to store coffee cake, and how to freeze coffee cake for a complete Banana Coffee Cake guide! This deliciously moist Cream Cheese Stuffed Banana Coffee Cake is a banana bread lover’s dream! Actually, it is everyone’s dream because my husband was going crazy for this coffee cake, and he doesn’t even like banana bread! 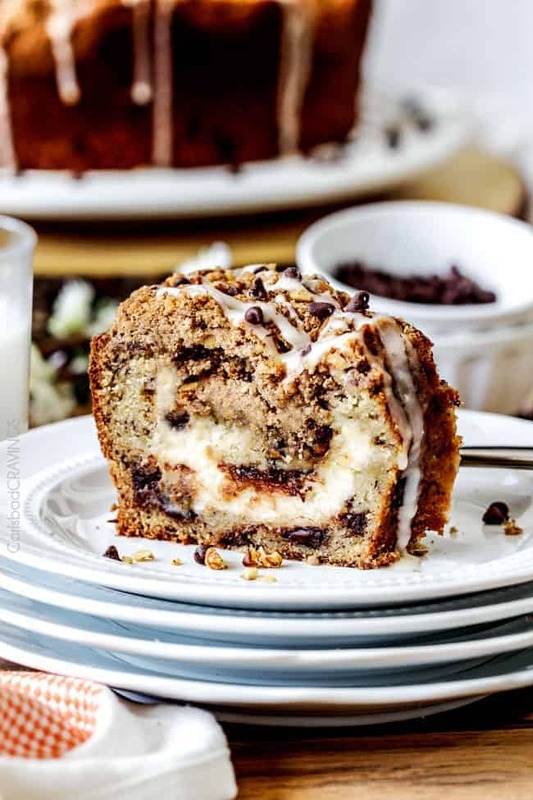 This Coffee Cake tastes like sweet banana bread with bursts of chocolate, slight crunch of walnuts with a mega creamy cheesecake-like layer of cream cheese all topped with Cinnamon Walnut Streusel and a kiss of Vanilla Glaze. It is basically one of my favorite Ben and Jerry’s Ice Cream’s – Chunky Monkey – in cake form. And I loooooove Chunky Monkey and now I loooooooove this cake! I played off of my Cream Cheese Stuffed Carrot Cake for this Coffee Cake inspiration, but I used a little different technique for the cream cheese layer by incorporating some of the batter into the cream cheese instead of egg/flour so it is even creamier and thicker. This Banana Coffee Cake requires just a few extra steps, but it is totally worth it and really is quite simple. Does coffee cake have coffee? When I first posted my Strawberry Cream Cheese Coffee Cake, I received comment from a reader that they were confused – nowhere in the recipe did it call for coffee?! I guess the term “coffee cake” is a widely popular American, but not world-wide used. 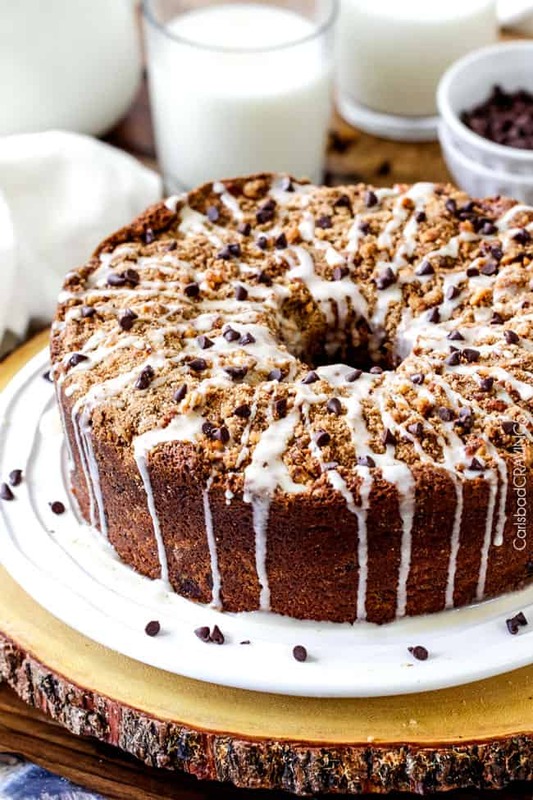 So, I hope I don’t disappoint some of my readers when I tell you that this Coffee Cake does not have coffee – but it does have bananas, cream cheese, walnuts and chocolate chips! Why is it called a coffee cake? If Coffee Cake doesn’t have coffee, then why is it called Coffee Cake? Coffee Cake is a term used for cake-like sweet breads commonly served alongside coffee or tea at breakfast or brunch. I guess because Coffee Cake is not frosted, they are acceptable for a morning indulgence. Bring on the cake for breakfast! What is coffee cake made of? 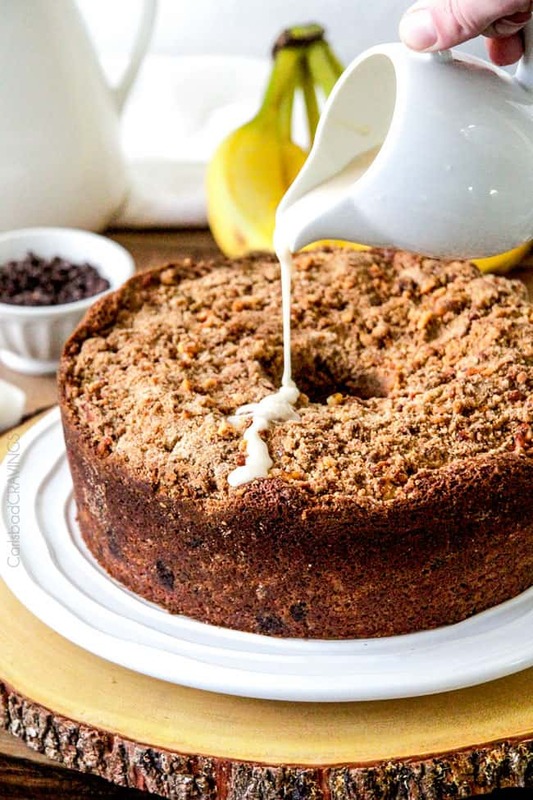 Coffee cake is a moist cake with a tender crumb with streusel topping and cinnamon. 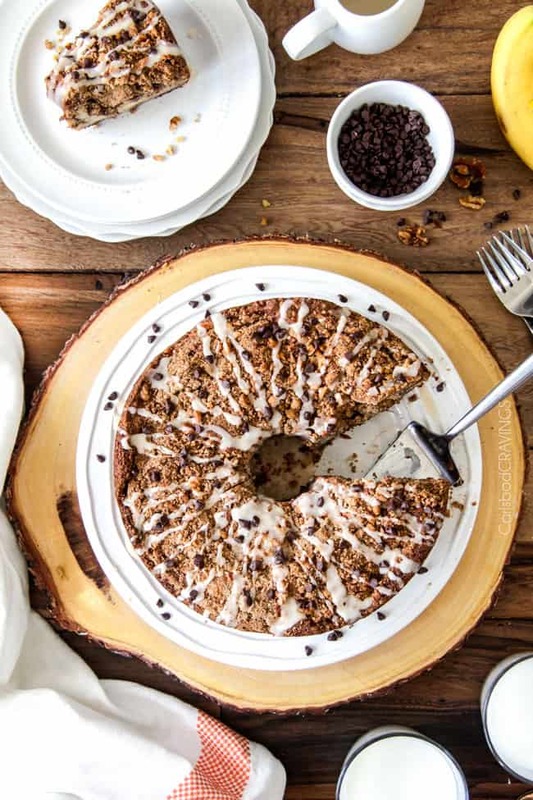 Coffee Cakes often contain chocolate, fruit or nuts – and this Banana Coffee Cake has all three! Coffee cakes stand apart from other cakes because they are not frosted. Instead, streusel takes the place of the frosting, often with a glaze drizzled on top. To make this breakfast, brunch, or dessert dream, you need ripe bananas, and I, for one, hardly ever plan ahead enough to have perfectly ripe bananas when I want them. 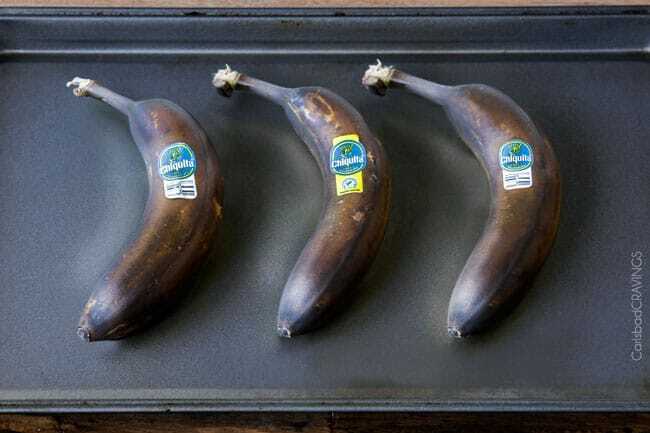 So here is a little magic trick to transform your bananas into perfectly ripe bananas in just 25 minutes! 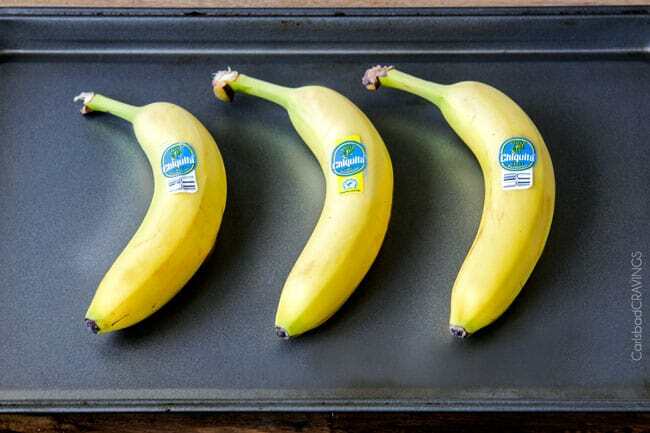 Simply line your bananas on a baking sheet (the bananas leak a little so you might want to line your sheet with foil) and bake at 325 F degrees for approximately 25-30 minutes or until your bananas are dark brown/black on the outside and slightly soft to the touch. Correct Pan: use a 16-cup nonstick TUBE pan. A bundt pan will not work unless because it does not have enough volume. Flour Pan: Spray all inside surfaces of your pan with nonstick cooking spray WITH FLOUR. This is my favorite easy method of greasing a pan but you may also grease and flour the inside of your pan. Make sure you cover every nook and cranny so the cake doesn’t stick and tear when you’re trying to remove it from the pan. Mix Dry Ingredients: In a medium bowl, whisk together flour, baking powder, baking soda, salt, and cinnamon. Set aside. Use Room Temperature Ingredients: Make sure your eggs, and sour cream are at room temperature before mixing. Room temperature ingredients mix much easier (so it’s harder to overmix) and result in a softer cake with maximum volume. How To Bring Ingredients to Room Temperature: If you haven’t planned ahead, you can quickly bring your eggs to warm temperature by adding warm (not hot) tap water to a bowl then adding the eggs (still in their shells) for about 20 minutes. Cream Wet Ingredients: Beat softened butter and sugar at least 3 minutes at medium-high speed until light and fluffy. This may seem like a long time but this is the only time you want to whip air into the cake batter to create bubbles. The bubbles will expand as the cake bakes, resulting in a lighter cake. Don’t Overbeat: Once you cream the butter and sugar, you want to mix the batter as little as possible. Add the eggs, one at a time, beating just until the yellow disappears after each egg. You never want to overbeat eggs because this can result in runny batter that may overflow when baking or a fragile exterior that crumbles and separates from the cake as it cools. Mix in the bananas and vanilla just until combined – again, don’t overmix, a few lumps are fine. 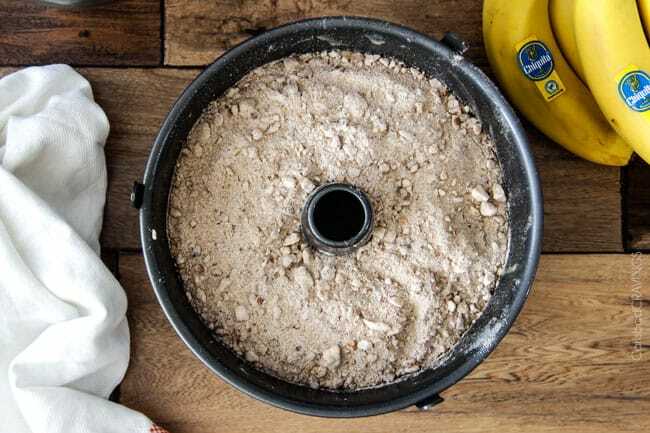 Mix Together: Gradually add flour mixture to banana/butter mixture in thirds, alternately with sour cream in between each third – the thirds don’t need to be perfect, just eyeball-it. Beat until just combined. Measure out 1/4 cup batter and set aside for cream cheese filling. 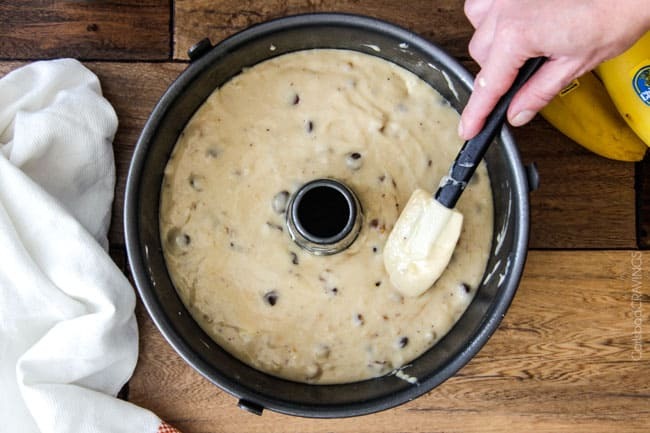 Stir chocolate chips and walnuts into remaining batter until just until combined. Measure out 1 cup batter (to top cream cheese layer) and spoon the rest of the batter into the prepared pan. Cream Cheese Layer: To your now empty mixing bowl, add 1/4 cup reserved batter, cream cheese, 1 teaspoon vanilla and 1/4 cup sugar. Beat on medium high speed until smooth and creamy, about 1 minute. Spoon Cream Cheese Filling over batter and gently smooth, but do not touch the sides of the pan. Spread reserved 1 cup batter evenly over filling (it will be very thin). Making streusel is very simple with the help of your food processor. Alternatively, you can chop your ingredients or smash them in a plastic bag then combine them with flour and cut butter in by hand. To make streusel: Add walnuts to your food processor and pulse 3 times. Add flour, brown sugar and cinnamon and pulse a few times to combine. Sprinkle cold butter over top and pulse until the walnuts are chopped and the mixture resembles small pebbles. You can make your streusel up to 3 days in advance and store in an airtight container in the refrigerator. How Long to Bake Coffee Cake? Bake Coffee Cake for 55-60 minutes at 350 degrees F or until toothpick inserted comes out clean. Oven temperatures and pans can affect cooking time. Some readers have commented that their cake was not baked in this amount of time. If your cake is not baked in 60 minutes – BAKE ON. Also, don’t be tempted to slice your cake while it is still warm. The Coffee Cake is continuing to cook while it cools down. While your Coffee Cake is baking – don’t peak! Don’t open the oven doors until it is time to check your Coffee Cake because opening the doors prematurely can cause your cake to cook unevenly and/or to fall. HOW DO I REMOVE MY COFFEE CAKE FROM THE PAN? Let Coffee Cake cool in the pan on a wire rack for one hour. After 60 minutes, firmly tap the outside of the pan a few times to loosen the cake. Place a baking sheet over the open side of the cake pan and hold the sides so you are holding both the edges of the cake pan and the baking sheet. Carefully and quickly flip the baking sheet and bundt cake over to invert the cake, then remove the cake pan. Invert the Coffee Cake back onto a cooling rack. Let the Coffee Cake cool completely on the wire cooling rack. Does Coffee Cake Need to Be Refrigerated? Freshly baked coffee cake without a cream cheese center can remain at room temperature but THIS coffee cake needs to be refrigerated. Make sure you tightly wrap your Coffee Cake in plastic wrap before placing in the refrigerator to prevent it from drying out. How long is coffee cake good for? This Coffee Cake can be refrigerated for up to 7 days but it is best (more moist) the first couple of days. Can I Freeze Coffee Cake? Yes! Coffee Cakes makes a fabulous make ahead breakfast for stress free mornings or special occasions. Turn out baked coffee cake onto a freezer safe plate/platter before topping with streusel. I recommend holding the glaze and instead drizzling it right before serving. Let Coffee Cake cool completely. Wrap cake tightly in plastic wrap then repeat with a second layer of plastic wrap. Next wrap tightly in 1-2 layers of foil until completely sealed. If you are freezing individual slices, then place these plastic/foil wrapped slices in a freezer bag. If you are freezing your entire Coffee Cake for an extended period of time, then secure the aluminum foil with freezer tape to prevent freezer burn. You can store your Coffee Cake for up to 3 months. When ready to eat, thaw overnight in the refrigerator. WANT TO TRY THIS COFFEE CAKE RECIPE? PIN IT TO YOUR BREAKFAST, CAKE OR DESSERT BOARD TO SAVE FOR LATER! Moist Banana Bread Coffee Cake stuffed with Cream Cheese is the best banana anything ever! 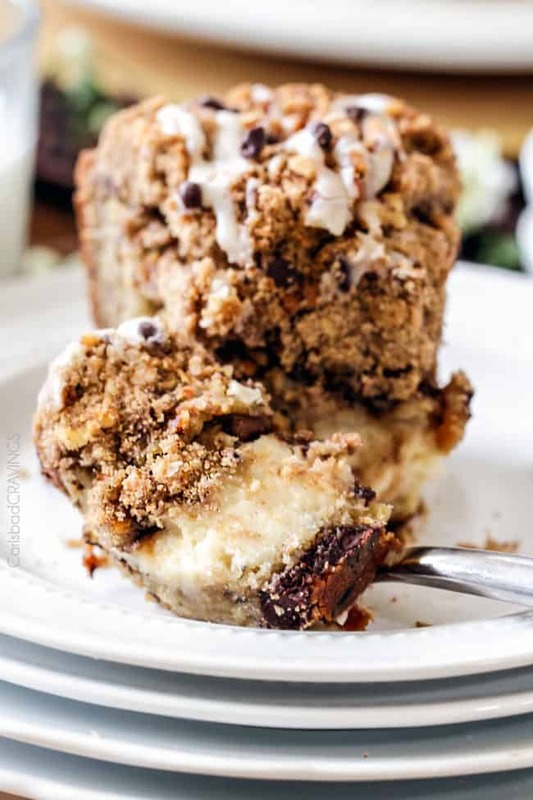 This Banana Bread Coffee Cake is riddled with chocolate chips and walnuts (optional) with an INCREDIBLY creamy cream cheese filling all showered with Cinnamon Walnut Streusel and Vanilla Drizzle! Tap pan on counter a few times to get rid of any air bubbles then sprinkle evenly with Cinnamon Walnut Streusel. Bake for 55-60 minutes at 350 degrees F or until toothpick inserted comes out clean (without inserting in cream cheese). Some readers have stated their cake was not done in 60 minutes, so if it's not done, bake on! Let baked cake cool on wire rack for 1 hour. Gently invert cake onto a baking sheet, remove pan, and invert back onto cooling rack streusel side up. Let cool to room temperature. *A bundt cake pan will NOT work in this recipe because it does not have enough volume. 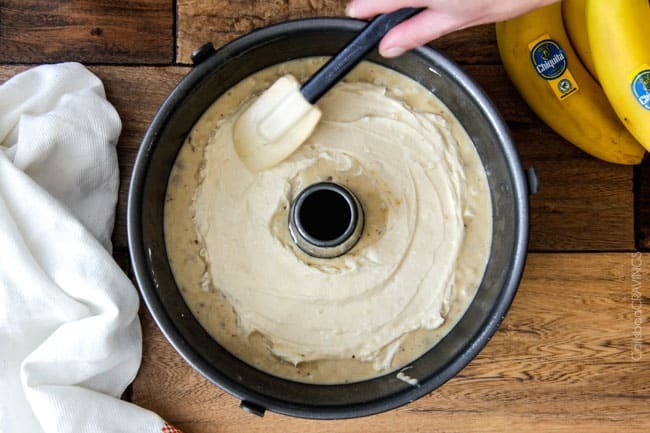 How did you get the banana bread out of your bundt cake pan? Hi Shushila, it is a tube pan as instructed so the bottom removes. Enjoy! If you don’t have a tube pan is there a way to make this in a normal cake pan? Others have commented that they made it in a 9×13 and that worked!